About 10,000 members of German organizations lined the pier. 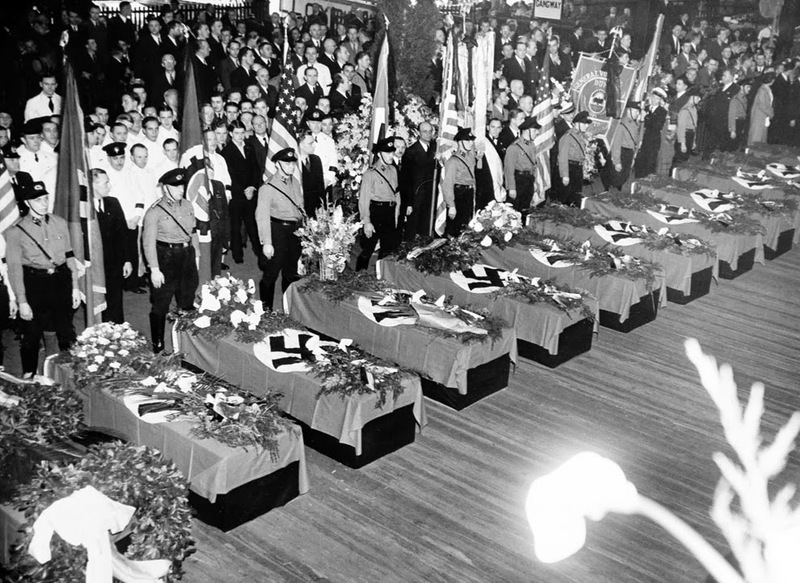 In New York City, funeral services for the 28 Germans who lost their lives in the Hindenburg disaster are held on the Hamburg-American pier, on May 11, 1937. About 10,000 members of German organizations lined the pier. Seems to be a mixture of Nazi Germany, American, and German-American Bund flags. Hindenburg, the massive German airship caught fire while attempting to land near Lakehurst, New Jersey, killing 35 people aboard, plus one ground crew member. Of the 97 passengers and crew members on board, 62 managed to survive. The horrifying incident was captured by reporters and photographers and replayed on radio broadcasts, in newsprint, and on newsreels. 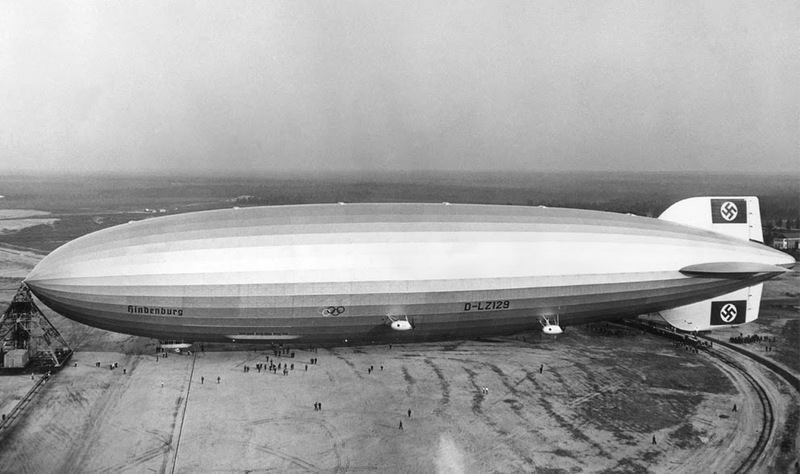 News of the disaster led to a public loss of confidence in airship travel, ending an era. 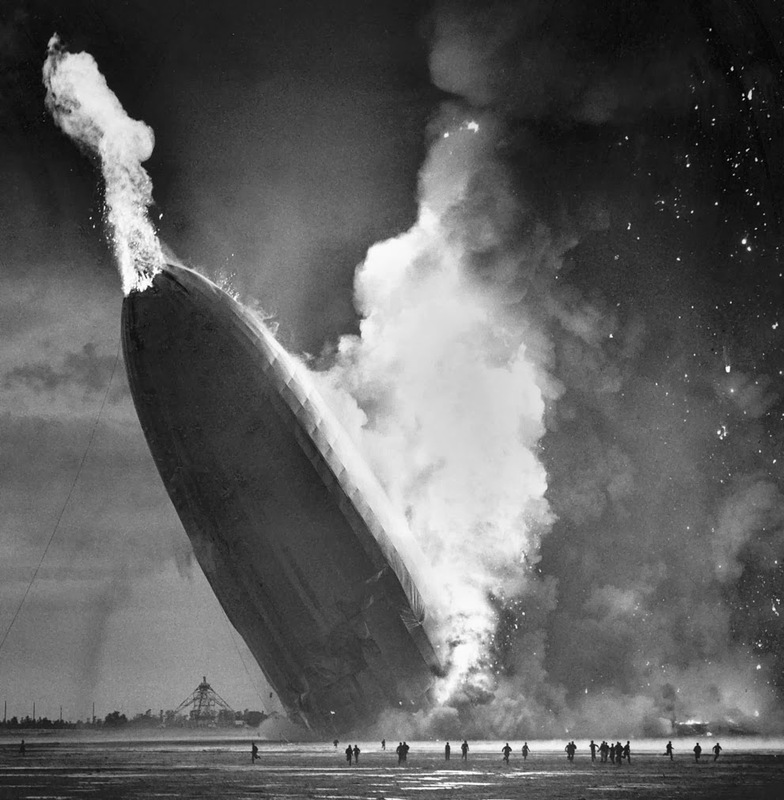 The 245 m (803 ft) Hindenburg used flammable hydrogen for lift, which incinerated the airship in a massive fireball, but the actual cause of the initial fire remains unknown. 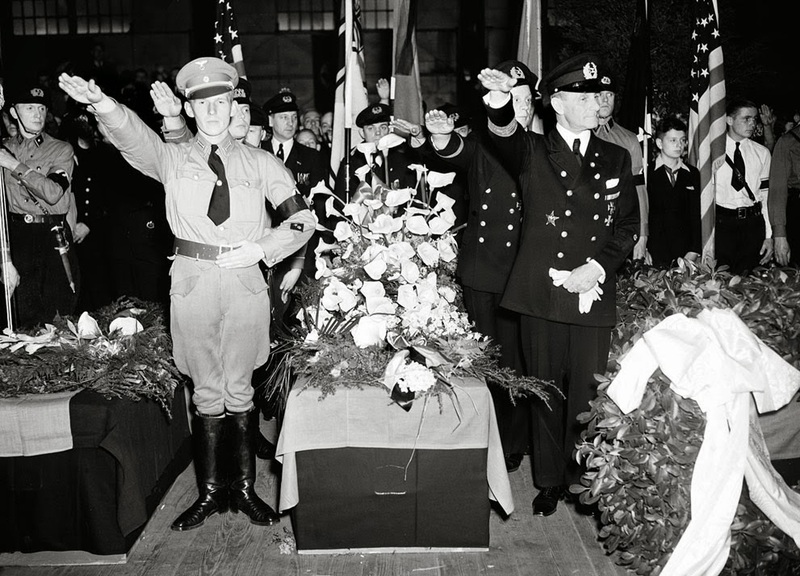 German soldiers give the salute as they stand beside the casket of Capt. Ernest A. Lehmann, former commander of the zeppelin Hindenburg. 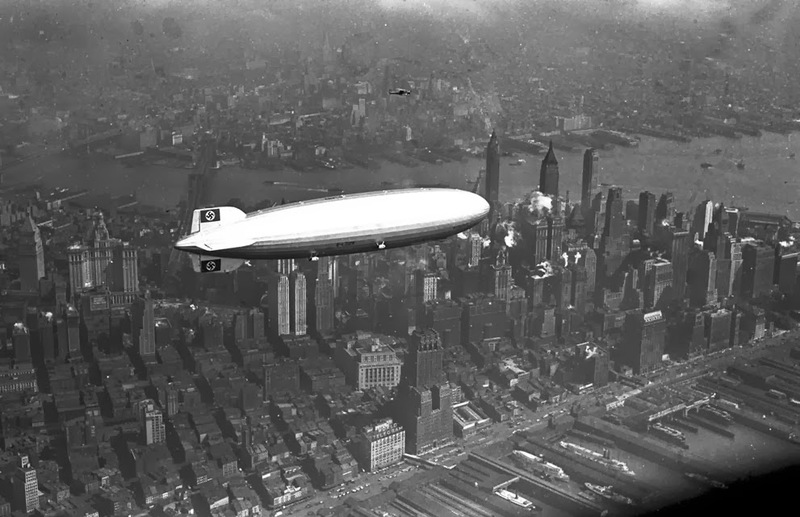 The German zeppelin Hindenburg flies over Manhattan on May 6, 1937. A few hours later, the ship burst into flames. 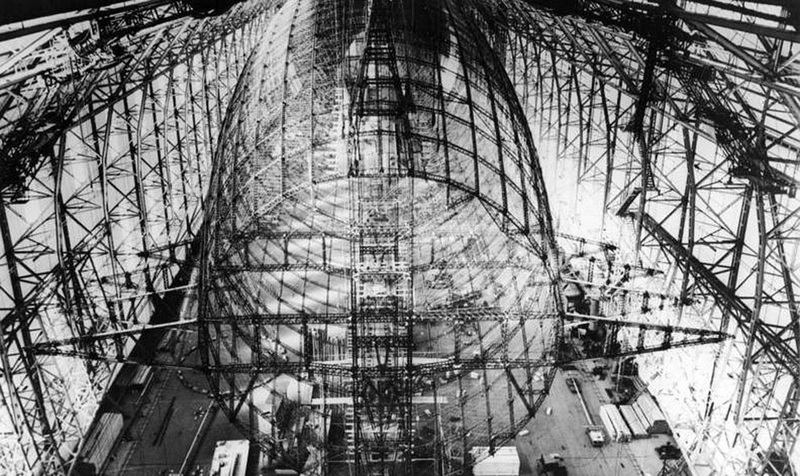 The steel skeleton of “LZ 129”, the new German airship, under construction in Friedrichshafen. The airship would later be named after the late Field Marshal Paul von Hindenburg, former President of Germany. The Olympic rings on the side were promoting the 1936 Berlin Summer Olympics. Prior to the Hindenburg disaster, the public seemed remarkably forgiving of the accident-prone zeppelin, and the glamorous and speedy Hindenburg was still greeted with public enthusiasm despite a long list of previous airship accidents. But while airships like the British R-101, on which 48 people died, or the USS Akron, on which 73 were killed, crashed at sea or in the darkness of night, far from witnesses or cameras, the crash of the Hindenburg was captured on film, and millions of people around the world saw the dramatic explosion which consumed the ship and its passengers. And despite its romance and grandeur, technologically the Hindenburg was obsolete before it ever flew. On November 22, 1935 — three months before Hindenburg first took to the air — Pan American Airways’ M-130 China Clipper made the first scheduled flight across the Pacific. The longest leg, the 2,400 miles from San Francisco to Honolulu, was longer than distance required to cross the North Atlantic. In fact, Pan Am’s M-130 was designed not for the Pacific, but for the Atlantic; only political (not technological) considerations prevented Pan Am from inaugurating transatlantic airline service in 1935; the British refused to grant Pan Am landing rights until Britain had a plane that could make the same flight, but Britain was far behind America in the development of a long-distance airliner. 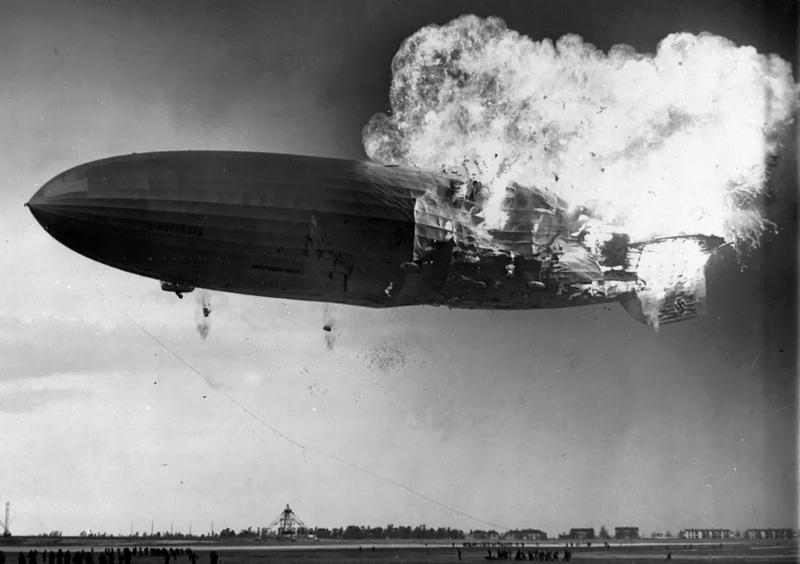 At approximately 7:25 p.m. local time, the German zeppelin Hindenburg burst into flames as it nosed toward the mooring post at the Naval Air Station in Lakehurst, New Jersey, on May 6, 1937. The airship was still some 200 feet above the ground. As the lifting Hydrogen gas burned and escaped from the rear of the Hindenburg, the tail dropped to the ground, sending a burst of flame punching through the nose. Ground crew below scatter to flee the inferno.